Chelsea Tuohy grew up in land-locked East Texas before venturing off to pursue her career in marine science along the US East Coast and the Caribbean. 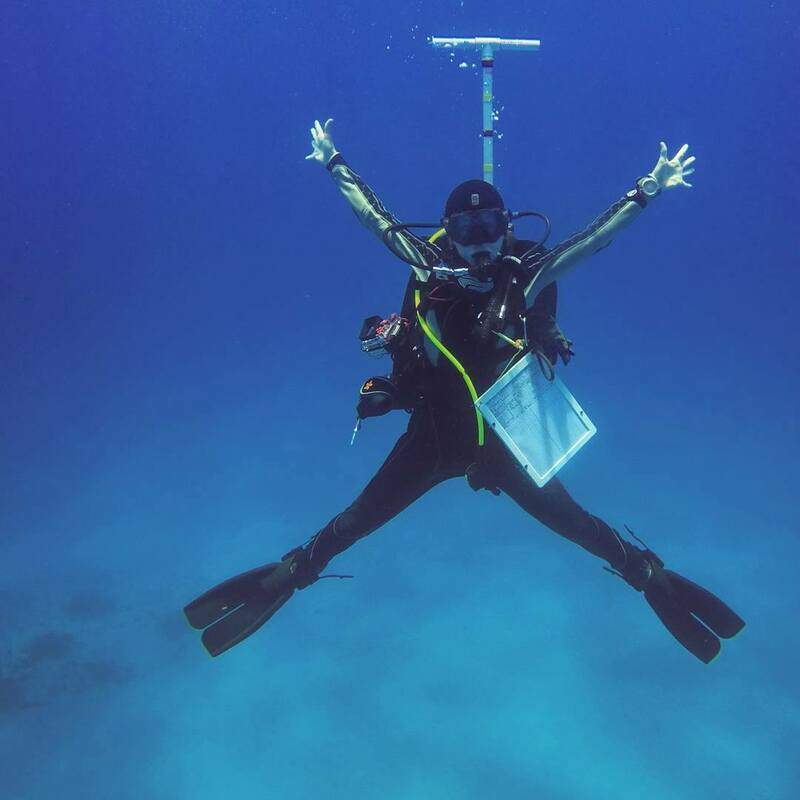 While in graduate school, she founded a company that hosts tropical marine field courses in Puerto Rico and designed an interactive tablet application that helps users learn how to identify fish – while underwater. I chose to build my own career because I was tired of reading about the end of Academia (i.e. ‘adjunct or die’) and listening to colleagues describe their attempt to climb the ladder to professorship before giving up and leaving their field altogether. This isn’t everyone’s story, but it seems to hold true for many recent graduates in the field of marine science. Education is expensive, tenured positions are rare and grants are increasingly competitive (which is only feared to get worse). When I was still in graduate school, I discovered what I loved most about my field was the time I got to spend in the water, under the water and interacting with people who also loved these things. My expertise is fish biology, so I spend a lot of time watching fish, counting fish, dissecting fish, talking about fish and working to protect fish. I realized that my happiness came from doing the research and instructing students in the process. So I turned that passion into something I could call a career, and founded Isla Mar Research Expeditions plus picked up a few other neat gigs along the way (including developing an iPad app!). My biggest influence was my Masters advisor, and current mentor, Dr. Ralph Turingan at Florida Institute of Technology. I have never met someone so determined to see his students succeed and someone so willing to give his time and energy to make it happen. Ralph grew up in the Philippines and did not have anything handed to him. He worked hard for his education and landed an incredible job at a great university. He has guided me along the path to starting my business, and encouraged me to take the leap at the time I did, rather than waiting for things to fall into place at the time I thought would be more appropriate. I couldn’t be more grateful for that. The defining moment was when I realized that Academia was not where I wanted to be, that came around the time I was preparing to defend my dissertation. Throughout my entire journey in higher education, I was working towards the goal of getting a tenured position as a top university so I could do what I loved: teach. As I talked with my mentors, other professors, colleagues and recent grads, I slowly discovered that maybe this wasn’t the dream I was destined to follow. In undergrad, we’re told “go to graduate school so you can get a Ph.D. and land a good job”. In graduate school, we’re told “gain experiences so you can be more versatile and competitive… oh, and publish a lot of papers”. Some of that happened, some of that didn’t. And as I set down at my advisor’s desk and hashed out where I wanted to take my career, he gave me a piece of advice that has truly stuck – “You can aim to be a top scientist, publish a lot of papers and land a career where everyone knows your name. Or you can hone your skills on a regionally-relevant topic and become an expert in that field. The latter is where you can also have a family and spend time with kids”. That solidified the obvious. I wanted a career where I could be in the field as often as I wanted, set my own schedule, write my own grants… and have a family. One of my biggest accomplishments as an entrepreneur is the app that I envisioned and designed to teach novice surveyors how to identify Caribbean fish while underwater. When I first started my company, I hosted field courses that instructed undergraduate students in a method to survey fish – called underwater visual census. Most of these students had no experience with fish identification. I noticed that it was sometimes overwhelming for students to do a survey and spend the majority of their time trying to describe the fish so they could identify it later with a reference book. That had to change, and there had to be an easier, faster way to train. So I pitched the idea to a graphic designer (hobbyist app developer) friend of mine who instantly saw this as a game-changing idea and jumped on board. Together with a group of volunteers, we crowdfunded to raise money to buy tablets and underwater housing and to help offset costs of development. We unveiled Artedi in January 2016, but the story doesn’t end there. The app is different from anything else on the market. We are currently the only app that can train users how to conduct fish surveys and learn to identify fish simultaneously. One of the best features of the app (that we will maintain for all new additions and versions) is the ability to upload data as a .csv file. You essentially email it to yourself when you’ve finished your survey, then open it in Excel and all of your data is there, nice and organized. This saves HOURS of post-processing time that most fish biologists are all too familiar with. My favorite moments during development were taking divers out to test the app. It was the best feeling of accomplishment to come up from the dive and have the students rave about how easy it was to use, how helpful it was to learn fish…. It felt like I really found a solution. It brought me back to why I chose to go independent with my career. This was teaching in a real-life scenario, instructing a skill that would be useful to the future careers of these students.. And it got me in the water. The vision is to take Artedi a step further and develop for Android tablets, then to strip the app of the “training” esthetic and integrate more features that expert scientists will find useful. Right now, it’s specifically a training tool. We’ve received some funding from NOAA’s Sea Grant to continue this work, and an Android version plus an expert version are aimed to be unveiled by 2019. I take advantage of educational listservs, conference exhibitions and my network – mostly word of mouth for recommendations. But I also use social media advertising on Facebook and Instagram. I have not really tapped into Twitter yet, but I’d love to learn some of the tips and tricks for that market! I have also started using Hootsuite to help manage all of my social media accounts in one place. I am still experiencing setbacks. It’s part of the journey. I have found the most difficult part is finding the right market and staying on top of advertising. Since my app is free, it’s been a challenge to find the right balance between paid advertising and promoting a more organic (and free) awareness. I’ve learned that it pays to spend time searching for the hints and tricks of the social media game – it’s a lot of computer time, but it does pay off. Take advantage of your network and the folks who are interested in your service/product/etc. You never know who will be able to hold the door open for you to step into the spotlight. Take time to build relationships with all types of people in various fields, especially in scenarios where you both can mutually benefit. Then, don’t be afraid to say “yes” to accepting help, and be sure to pay it forward. Teach us something about crowdfunding. Can you recommend any favorite websites to learn that topic? I found that crowdfunding for the initial development of this app helped our team gain a lot of exposure for the idea. We met all kinds of people who had advice, and many who offered to interview us and share the story to help us achieve our fundraising goal. I used Experiment.com, which is essentially a crowdfunding platform for scientists. We met the co-founder who flew down to Puerto Rico to visit with us after our campaign was successful. It was humbling to meet him and discover he was another young entrepreneur. Since government-funded grants are harder and harder to come by, I would highly recommend that young scientists check out Experiment.com and consider crowdfunding their projects. My app developer and I used two programs to communicate – Slack and PivotalTracker. Slack allowed us to organize our discussions by hashtags so that we could focus on the various aspects of the design process. PivotalTracker helped us keep up with deadlines and make sure that all the features, bugs, etc. were being completed. And while I was in graduate school, I took advantage of every “student” version of new online chart building sites (Plotly), graphic design (Canva), newsletter and digital media creation (Lucidpress). I have really taken a liking to Crossfit, and I go train in the mornings. I love the adrenaline and the surge of energy I get after exercising. I also take little breaks throughout the day – step away from the computer, go outdoors – this helps refocus my mind when I have to reel myself back in. I am also a yoga instructor, so I find that ending my day on the mat allows me to recover for the next day. There may also be a glass of wine somewhere in there too. The present. Don’t get too caught up in the future and trying to always be one step ahead of the rest. It’s important to take time to experience the journey because that is where you develop relationships and build your network in a meaningful way. Well, my education took about a decade. Without that, I wouldn’t be where I am today. Coming to terms with the idea of working for myself took another year to settle in. That process involved lots of discussions with mentors, lots of slow and steady trial and error, and then a big leap to getting a brick-n-mortar office space with classroom that we have now. In those early stages there was a lot of self-doubt; a lot of uncertainty about whether I should just keep looking in Academia, or branch out and focus on what I truly love doing. Now when I think back on that, the answer seems obvious. But there are tradeoffs – one being financial security. When you’re independent, you can only make as much as you are willing to work for – and when you’re starting out, sometimes it’s hard to really find that limit. But I am a firm believer that hard work pays off, and that challenge has never stopped me before. I love to read and reread The Alchemist by Paulo Coehlo. This book finds an appropriate time to resurface at various stages of my life. I also really enjoyed Ocean Country by Liz Cunningham and I would recommend it to anyone looking to gain some “ocean optimism” and insight to the hope that still lives among marine scientists. I want to see the app flourish and be used by students and citizen scientists all over the Caribbean – and eventually the Pacific once we transition our theme to that region. We really want to keep the app free, because we know what it’s like to be students and have little income. The goal was to create something that would be a free learning tool; we pay too much for education as it is. We need something free every now and then. In the next few years, we hope to see the app get picked up by a major sponsor that can help us fund the continued development and maintenance.